I read my comics digitally these days and when I get to the end of an issue, I'm invited to rate the book. I'm not a great one for rating comics, preferring to let words do the work, but touching the Comixology stars changes their colour. And that just makes me happy. Yes, I am five. And despite liking the contrast between white and green stars, five is the rating I always give this comic. Giving it fewer would be ridiculous, because The Vision is a modern masterpiece. 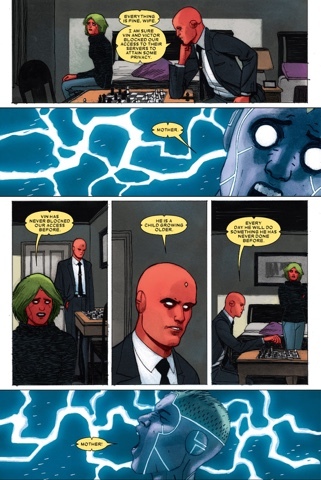 To recap, longtime Avenger the Vision is trying to build a family life for himself with a family he's built. There's wife Virginia, 'teenagers' Viv and Vin and, most recently, Sparky the dog ('Woof, Woof'). Over time they've been growing more and more emotions, with Virginia frustrated by not knowing from whom her husband took her brain patterns and the kids trying to negotiate the emotional hell that is high school. Avengers villain the Grim Reaper came calling, got himself killed and Virginia's buried him in the garden and not told her husband. And other terrible, tragic things have occurred. Earth's Mightiest Heroes, wanting to know the truth behind a couple of suspicious deaths, sent Victor Mancha - Vision's brother, in a twisted, Ultron way - on a visit to see what he could learn. But that's not gone well. And this issue, things just get worse. Virginia wants her husband to show some concern over the fact Vin and Victor are both incommunicado, and their location chips aren't working, but he's in denial and acting rather blasé. Victor, meanwhile, turns out to have some weird robotic drug addiction to Vibranium. This can't end well; indeed, the apparently omniscient narrator's been telling us from the first issue that things end, well, is 'apocalypse' too small a word? The only glimmer of hope I have comes from knowing who the narrator is - that's revealed a few issues in - and suffice to say, they're one of those Marvel characters who deal in half-truths and need-to-knows. Tom King is writing a brilliant suburban superhero horror story - there's a crescendo of dread and who knows what the final note will be when this 12-issue series wraps. There's a car crash coming, but King's measured prose won't let us look away. Partners Gabriel Hernandez Walta, on illustrations, and Jordie Bellaire, on colours, pick up the mood and run with it - the deceptively quiet images and subtle colour choices make for a hypnotic mix. I especially like Bellaire's palette in this flashback, while Walta's gift for hiding the weird among the banal is perfectly exemplified in the title panel. And yes, that's 'panel' - the credits page doesn't need a splash, so it doesn't get one; King doesn't waste space, he lets the art go big at appropriate points only. And we get a couple of big moments here, as I hope you'll learn. In Omega Men, King's recent DC sleeper hit, he wrote his scripts in such a way that the panel layouts from each end of the issue mirrored one another, meeting in the middle. It didn't really add anything to the story for me, but goodness, I loved the idea... symmetry is almost as cool as changing the colour of stars. 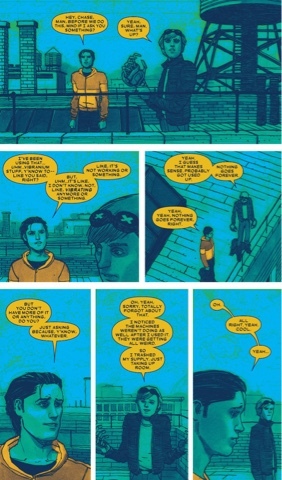 With the Vision, King sometimes has the narrator repeat certain lines, as he does in this issue to emphasise the sadness of a situation. Again, it's not a 'trick' that draws attention to itself, but when you notice it there's an extra frisson from knowing we're in the hands of someone who really loves words. Speaking of words, letterer Clayton Cowles brings his own art to proceedings. As for the cover, Michael del Mundo provides a spookily suspenseful image - who is that in the dustbin? 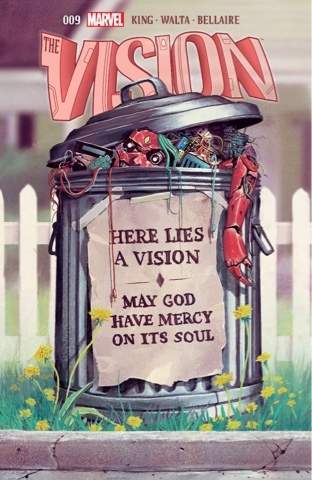 With creators at the top of their game using Marvel history to craft a story that's startlingly fresh, it's fair to say The Vision is a precision machine that will be enjoyed for years to come. The plot of this sounds suspiciously close to an episode of Star Trek Voyager. Luckily no-one watched that, so Marvel should be okay. Do tell! The Vision's history is so fundamental to this series that I'm interested to know what the Trek equivalent was. Well, if I simply MUST talk about Star Trek... but only because you're twisting my arm, you understand. It was a plot about the holographic Doctor character, who made himself a holographic family so he could be more grounded and relate to the rest of the crew, only one of the crew feels his family is a bit too perfect to be real and goes behind his back and reprograms them to have their own lives rather than just revolving around him. Can't remember the details of the rest of it, but as I recall, his son turns to knife-related crime, his wife leaves him, and then his daughter dies. It was a comedy episode.